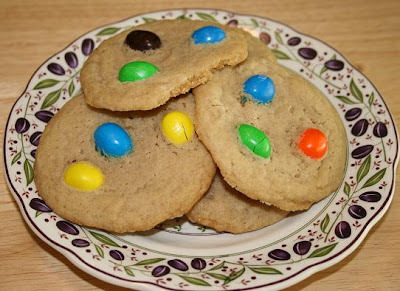 Dave brought home a bunch of M&Ms the other day, so I made cookies to stop myself from eating all the candy. We rarely ever have candy in the house, so when we do, willpower goes out the window. Once the cookies were made I froze them for Dave's lunches. This recipe is pretty good but I found the cookies to be a bit greasy when they were still warm. Once they were cooled they were much better. It may be the shortening as it is not something I use very often. The recipe is from allrecipes.com. In a large bowl, mix sugars, shortening, eggs, and vanilla thoroughly. Add flour. salt and baking soda, mix well. Add 3/4 cup M&M candies. Drop dough by treaspoonful onto cookie sheet. Push a few candies on top of each dough ball. Bake at 350F for about 9-11 minutes, until golden. i wanted so much to be vegetarian, but fail every time i try. Any suggestion? love ur blog n all those recipes. Hi! Thanks for reading the blog and for your comment. When I decided to be a vegetarian I did it "cold turkey"; I just decided one day not to eat meat and I stuck to that decision. My husband became a vegetarian gradually, and I think that is probably the easier way to do it. I used to have nightmares that I accidentally ate meat when I was first a vegetarian, and since I didn't do any planning I had no idea what I could eat. Perhaps you could set aside a certain number of days a week to avoid eating meat. Or, you could start making vegetarian versions of some of your favorite foods, veggie burgers instead of regular burgers, cheese pizza instead of cheese and sausage. Things like that. If you eat out a lot try and pick restaurants that offer some veggie selection; pasta is a great standby. Small changes can lead to big changes in time. If you start introducing veggie foods into your diet a little at a time I think you'll have an easier transition going meatless! Good luck and let me know if you have any other questions or need help with recipes!! april rd- I just realized that you're in Malaysia and I am not really familiar with Malaysian cuisine. If you want help coming up with veggie versions of certain dishes just let me know!